Guelph, ON—When newlyweds Zhenhua and Xiaoke settled in Canada in 2014, the last thing they expected was a relationship with Jesus Christ. 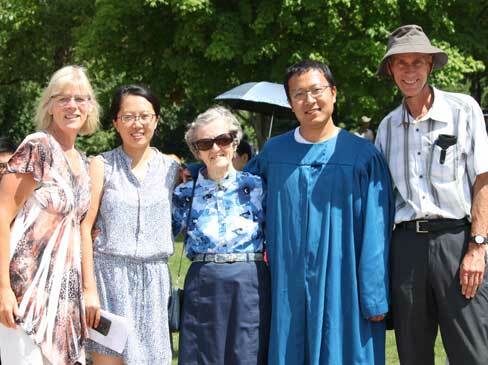 For Zhenhua, who left China in 2011, the move was a chance to complete a doctorate. His wife, Xiaoke, simply wanted to join her husband and begin married life. But they got far more than they bargained for. In 2014, shortly after joining her husband, Xiaoke reconnected with Dave and Linda Buchner (ISMC staff). She had met them during a previous 2013 visit to Guelph. While attending the Buchner’s FOCUS English classes, she met ISMC staff Henk and Mieke Wichers. Despite the truths he heard and the evident changes in his wife’s life, Zhenhua remained reluctant to give his life to Christ. Only when he met Xiaoke’s friends, Henk and Mieke, did he begin to change his mind. Not long after Zhenhua was baptized in 2016, Xiaoke witnessed more miracles after sharing the gospel with her brother and 90-year-old grandmother, she saw them accept Christ as Lord and Savior.